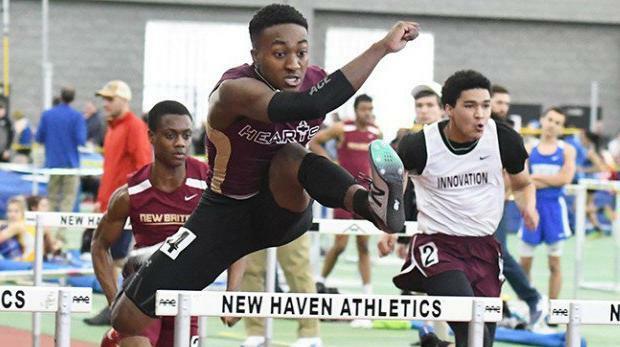 New Haven, CT - There was tremendous action at the CIAC Open, we'll try to summarize the 30 events from the results as best as possible from the results. The boys team battle was very close going into the final section of the 4x400m track event, as Bloomfield led Hall by 3 points and Hillhouse by 6, with points from a yet untallied high jump also potentially affecting the outcome. Hillhouse won the final relay, but Hall finished a close 2nd and Bloomfield took 5th in the finals race and was bumped back out of the scoring to 7th as Weston and Glastonbury claimed 4th and 6th from the previous section. In the end, Class LL champ Hall was on top in the CIAC with 43 points, M champ Hillhouse was 2nd at 38, and S winner Bloomfield was 3rd at 36.5. The girls side had less drama, as Class S champ Bloomfield piled up wins in the 55, 300, and 600 plus 2nds in the 300 and 4x200 and 3rd in the shot put on the way to 54 points and a dominating championship win. LL runner-up Glastonbury swept the 4x200m and 4x400m relays and got a 3rd in the 1000m on the way to 2nd place with 39 points. LL champ Danbury got a 1st, 2nd, and 4th combined from long distance and a 3rd in the long jump to take 3rd with 34 points, and host Hillhouse took a 2nd and 3rd in the mid distance events and 3rd in the sprint medley relay to get 4th at 32. All of the girls individual races were won by the top ranked athlete in the event, though in one case the champion was not seeded #1. The same was true for the field events until Wilbur Cross's Susie Okolie blasted a foot beyond her PR on her last throw to win the shot put. The boys also stayed pretty close to form in all of the individual track and field events with either the top ranked or top seeded athlete winning except in that unforgettable 3200m race. Meet records were broken on the girls side in the 55m and pole vault, and on the guys side in the 4x800m and SMR relays. For the individual events and the relays, we'll try to recapture the action as best as possible in the summaries below. All photos are from Krista Benson.